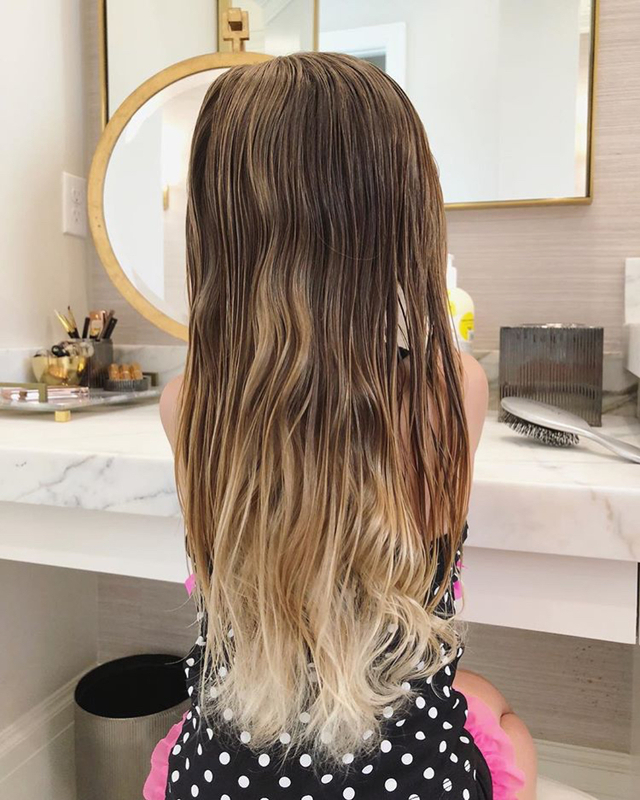 Ok today I wanted to share a little about Isla Rose’s hair since I get a ton of DM’s and emails about how I do it and the products I use. So first, she hates when I brush her hair! It felt like a battle most mornings but we finally established a system that works for both me and her and we can get her hair brushed and done without a massive melt down! I have a little pink kids chair from target in my bathroom and I have her stand on it while I brush through her hair. I always give her something to distract her and this has worked wonders!!! Those distractions are either her breakfast in the morning or I give her my phone to watch PBS kids or plays Endless ABC (if you don’t have that app get it. It’s the only game I let my babes play on my phone and it teaches them their letters). Spray Bottle: I always wet her hair and curls before I do any hairstyle. Even if I’m just leaving it down. I can style it easier and it finishes nicer when it’s wet. Leave in conditioner: (or detangler) I use this after her hair is wet. the It’s a 10! purple kind. This magical stuff helps me get through her tangles sooo much faster and easier than just water. I have like 5 bottles of these on hand because I can’t do her hair without it. 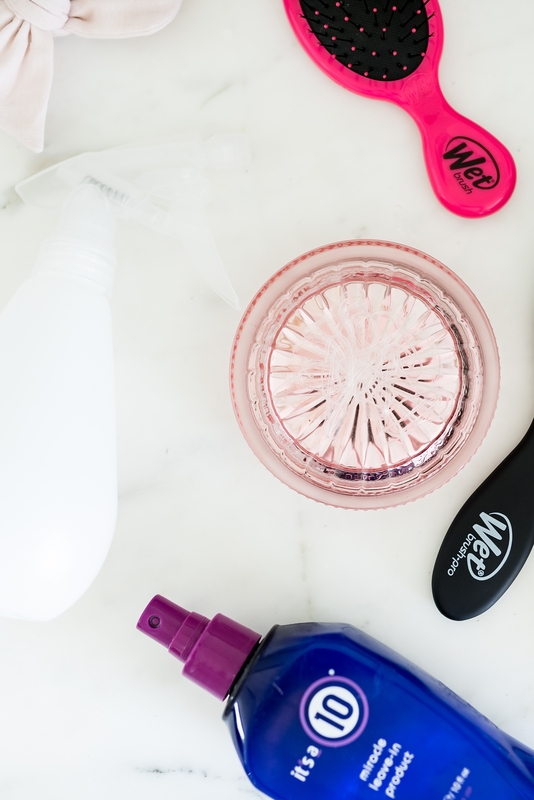 Wet brush: A wet brush is a thousand times more easy to get through tangles than a normal brush, it’s actually the only brush I use on my hair too. If you don’t have one- get one!!! I can really even explain how good this brush is, you just have try for yourself and see! Clear Elastics: I always have these on hand to do buns, pig tails, braids, etc. they hold her hair the best and they aren’t seen once they’re in so they look the best too! Smoothing Brush: I use this one after her hair is wet, all the tangles are out and I’m slicking it into pig tails, a bun or a half-up. It brushes the hair down and into the style you want so beautifully. I also use this brush when I’m doing my hair in a pony and for Jackson’s hair. 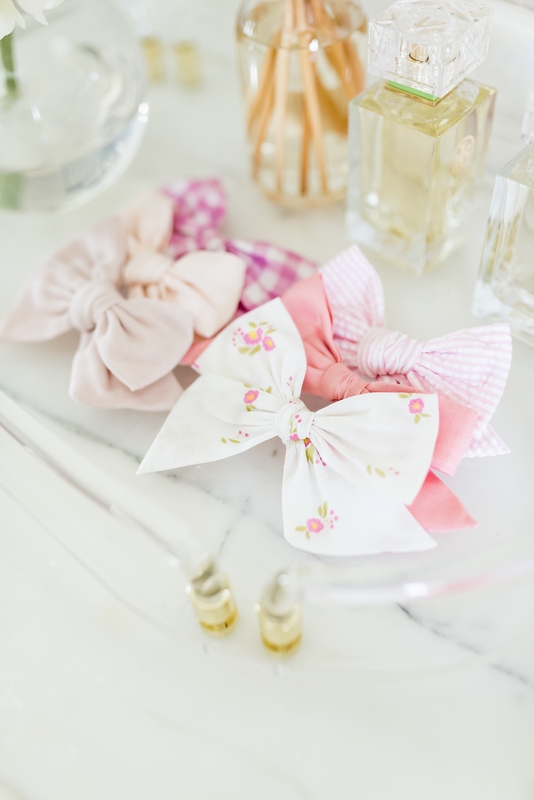 Hair bows: Are Wunderkin. They have the prettiest colors, fabrics and prints! Love their quality too! Her hair is naturally curly so I don’t ever put heat on it. I get asked a lot what I use on her curls and it’s just water and detangler. I have used a shine serum and mousse before but I haven’t used those in a long time. I think this answered most of your questions but if there’s something I missed let me know in the comments below and I will go through today and finish answering them! 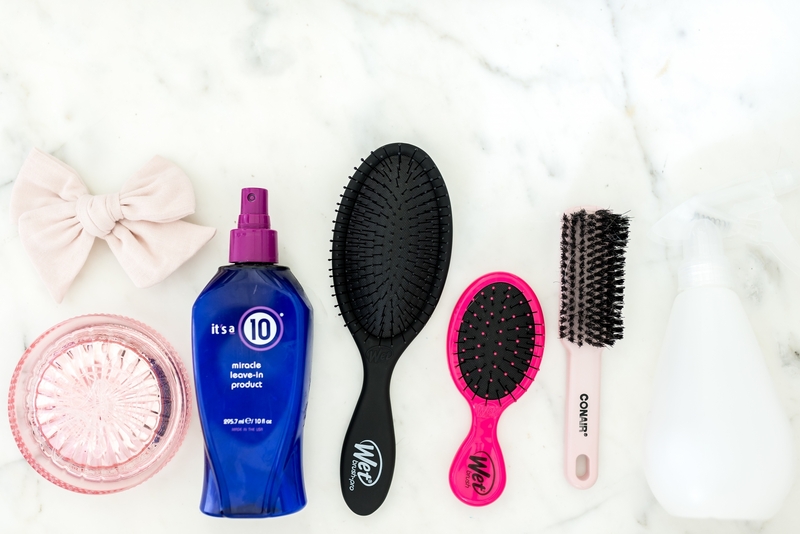 I love using it’s a 10 on my hair too! 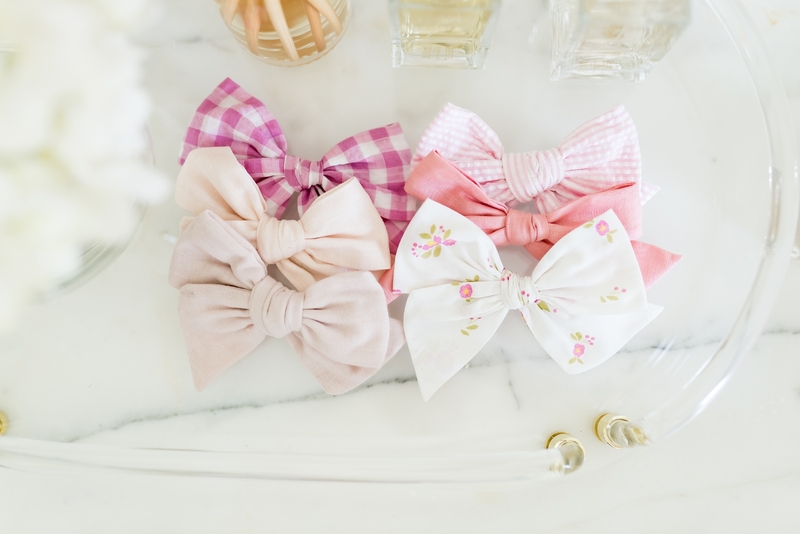 And how cute are those bows?! It’ is so amazing!!! I swear by it!! Love those bows! So cute! I love them so much!!! The colors and the quality are so amazing!! Such a cute little Principessa! ???? So adorable! Love the bows. ?? She’s so cute! And I love the cute bows you use for her hair! Love that suggestion!! Thank you so much!! Can you do a post about how to do your boys hair? My son is the same age and his hair always seems to be a mess no matter what we do To it ? Couple questions: 1. Isla’s Shampoo and conditioner routine? 2. Do those clear elastics hurt when you take them out? Thanks so much!!! CAn you tell me about the glass orthe aCrylic tray the bows are SITTING on? I think i saw the same tray at your alice lane presentation. I love it! Do you know where i can finD it? 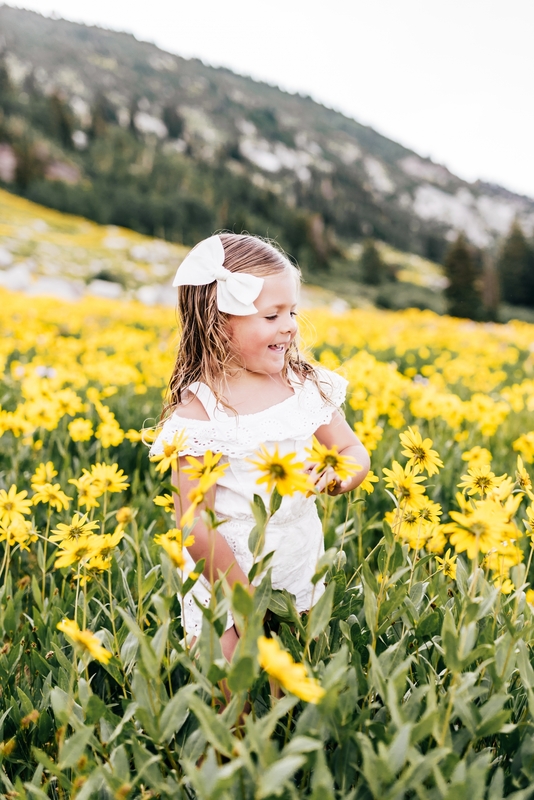 By the way isla is always so beautiful! What shampoo do you use on her hair? she has Gorgeous hair! Beautiful family! Thank you for sharing yoir routine. I noTiced that her hair looks beautifully tucked in and wet-like gbroughout the day, is that the AfFect of tye spray or sometHing else? Would really love to know ?